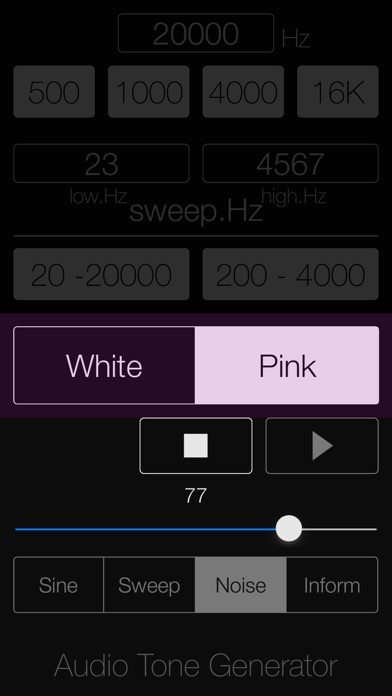 "Audio Tone Generator Lite" is a high quality Audio signal generator app for iPhone, which creates the audio reference signals as Sinewave, Sinewave Sweep, White Noise and Pink Noise. White Noise and Pink Noise generation. Supports of frequencies range between 20Hz to 20kHz. Testing for Loudspeakers and Headphones. Testing and tuning for Audio amplifiers, Equalizers and many other Audio equipments. Frequency response measurement for Audio systems using White noise and Pink noise. Relaxation and Meditation by using 1/f noise (White noise). Hearing Test to find the maximum frequency that you can hear. Mosquito sound creation for teenagers. Please visit Toon's iOS Apps Support page for more information on this app.